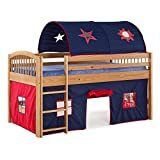 Sure to inspire imaginative play, the Alaterre Addison Junior Loft Bed with Tent and Playhouse features sturdy solid pine wood construction and a fabric tent and playhouse. A ladder is included for added safety and access to the bed. The tent and playhouse have sun, moon, star, and window cut-outs to peak through. Choose from available fabric colors and finish options. Dimensions: 43W x 78D x 66H in.. Pine wood frame. Available in your choice of finish. Includes fabric tent and playhouse. Sun, moon, stars, and window cut-outs. Tent with arched top. Ladder included . Dimensions: 43W x 78D x 66H in.